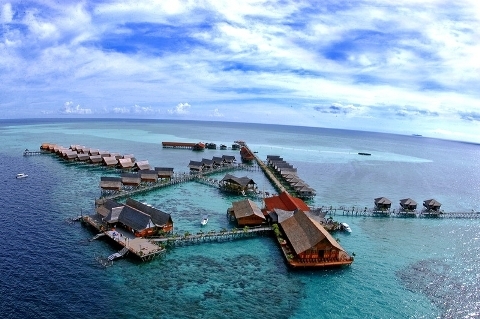 Accommodations in Sabah are diversified with plenty of luxury, mid range and budget hotels found throughout the state. Bed & Breakfast, hostels, home stay, hotel rooms and resorts can be rented inexpensively. There are also many all inclusive luxury resorts in the Kota Kinabalu, Papar and Semporna as well. In Kota Kinabalu you can find a lot of resorts and hotels that are both affordable as well as pricey. The best place to stay in this area has to be Mount Kinabalu area. Nearby is the famous Kinabalu National Park, this area has quite a number of lodges, hotels and resorts. Nearby Mount Kinabalu also offers some of the area best retreats with magnificent mountain view. For a diving vacation in Sabah, Sipadan Island and Mabul Island are both fantastic and offering magnificent underwater marine life. Both of these islands provide expensive diver resorts as well as affordable lodges. For visitors to Sipadan Island or Mabul Island, the resort on the Kapalai Island definitely worth for a stay, the resort is sitting on its robust stilts on the shallow sandbanks of the Ligitan Reefs which make it a unique and beautiful resort to stay in. Nearby Semporna also offers inns and home stay that are both suitable for backpackers. For visitors who prefer to stay in the city for sightseeing, Kota Kinabalu is good for stay in. Ranging from backpacker hostels to luxurious 5 stars hotels, there is wide range of accommodation options to suit every budget. Another well preferred tourist destination is Sandakan, visitors to Sandakan will get the chance to visit the Turtle Islands Park, Sepilok Orang Utan Sanctuary and the archaeological Gomantong Caves. This area is also known as a destination for eco-tourism with plenty of hotels and lodges available. For golfer, Beaufort homes to the Borneo Golf and Country Club where you will find an 18 holes golf course sitting on the edge of South China Sea at Beaufort coastline. Visitors can either check in to the onsite resort or choose to stay away from Beaufort. Another golf course that will offer you unique golfing experience is the Mount Kinabalu Golf Club. The golf course is located at 1500m above sea level and is one of the highest golf courses in South East Asia. With Mount Kinabalu surrounding you, this 18 holes course will sure to offer you a golfing experience that you will not get elsewhere. The Sutera Harbour Golf and Country Club with 27 holes golf course in Kota Kinabalu city is another must visit for golf enthusiasts. Located just about 10 minutes from the Kota Kinabalu International Airport, this golf club not only features a championship golf course but also homes to a 5 star resort which is well preferred by family and honeymooners. Visitors can also unwind and relax in the onsite spa center after a tiring and exciting golf session.